Is your exhaust fan drawing efficiently? 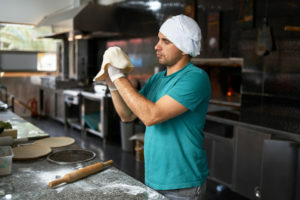 In commercial kitchens, your exhaust fan is an essential part of your exhaust system. It removes hot air and odors from your kitchen, plus it safely eliminates vaporized grease, which is a natural byproduct of cooking. If your exhaust fan isn’t cleaned regularly and in proper working condition at all times, it won’t draw properly, so it won’t be able to do its job well. As a result, grease will quickly built up in your commercial kitchen’s exhaust system and your risk of a flash fire within your exhaust ducts will increase dramatically. A flash fire could result in injuries to your staff, serious damage to your kitchen, and a huge interruption to the flow of your business. Avoid flash fires by always making sure your exhaust fan is able to draw properly. If you manage or otherwise work in a commercial kitchen, your mind is always running a thousand miles a minute. There are always so many important tasks that need to be handled right away. So how are you going to fit checking and maintaining your exhaust fan into your already jam-packed schedule? Well… you aren’t! Just enlist the expertise of Flue Steam and you’ll never have to worry about your exhaust fan drawing properly again. We provide regular cleaning services for your complete commercial kitchen exhaust system. Our cleaning services are thorough, fire-code-compliant, and affordable. We recommend signing up for hand scraping and steam cleaning services for your commercial kitchen exhaust system. Sign up for hand scraping services from Flue Steam and we’ll send a technician to your commercial kitchen on a monthly basis. It’s a simple, affordable, effective way to make sure grease deposits are removed from all accessible areas of your exhaust system including the ducts, drip cups, exhaust fans, and more. Supplementing with steam cleaning services 2-4 times per year will give you tremendous peace of mind. While steam cleaning does cost more than hand scraping, you’ll be able to rest assured that it reaches every inch of your exhaust system so it’s positively squeaky clean. After every hand scraping and steam cleaning service, we’ll provide “Certificate of Performance” stickers as proof that you’ve fulfilled your NFPA code obligations, so code inspectors will always be satisfied. Prevent emergencies by signing up for regular equipment inspections and cleanings by Flue Steam. Establish your partnership with us now by calling 800-700-FLUE or emailing contact@fluesteam.com to schedule your first cleaning service.